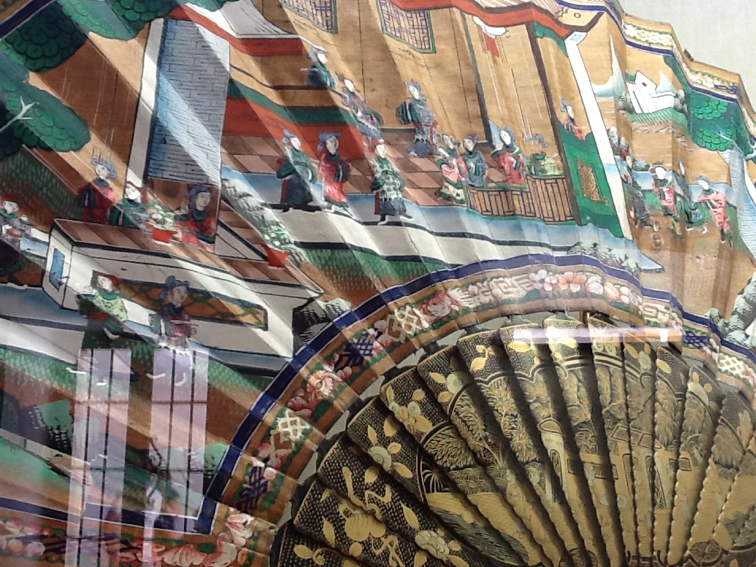 Posted by bethcarpenter in Travel Log. Below is a picture of me, my aunt and uncle, and some local friends from the nearby village. I visited my aunt and uncle in Málaga my sophomore summer of high school, and my mental idea of the Iberian Peninsula before this summer’s trip was purely based on my experiences in the southmost region of Andalucía. 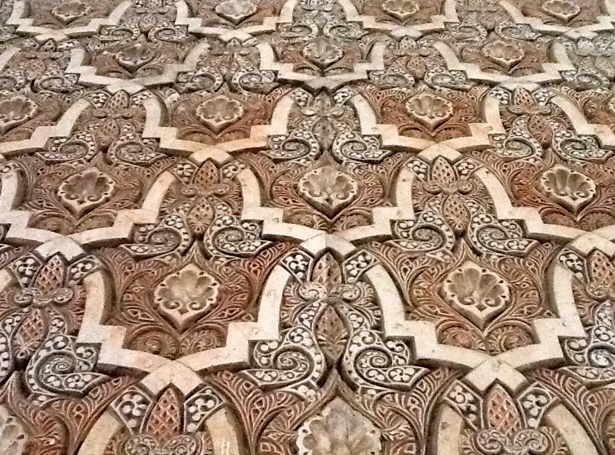 This area carries heavy Islamic influences that remain from the Moorish conquest in the 8th century lasting until the reconquest by Ferdinand and Isabella in 1492; the tradition of flamenco dancing and the sensual, rhythmic music that accompanies it are actually a result of gypsy/Spanish syncretism. 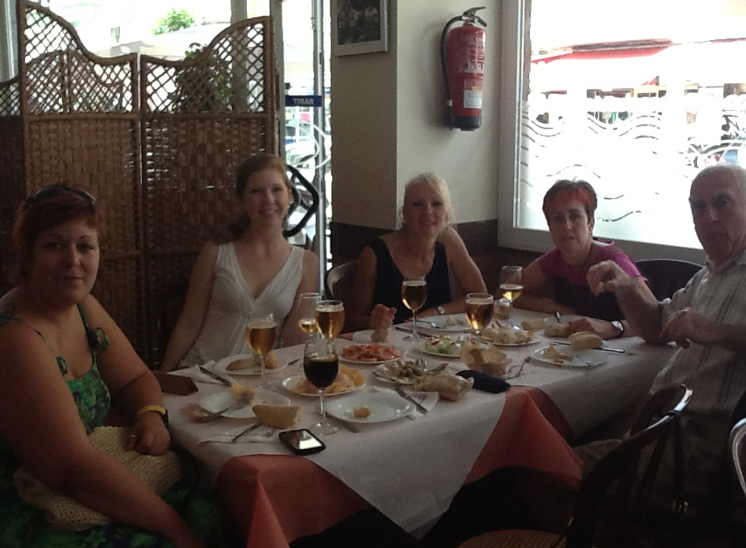 I was delighted to return last weekend for a four-day trip to Seville and Grenada! 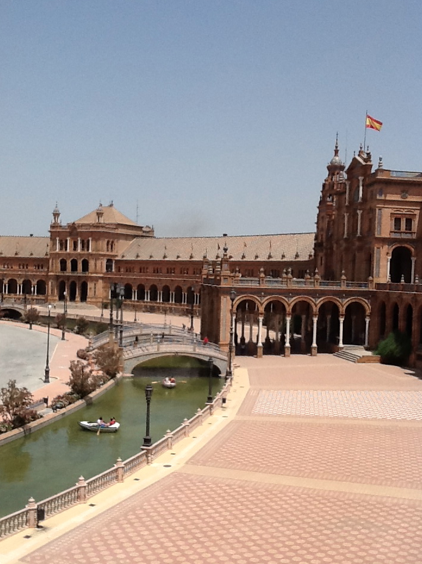 We took one of the famed European bullet trains for a three-hour journey to Seville, the setting of perhaps the most famous opera in the world–Carmen by Georges Bizet. I adored Seville so much, despite the four hour walking tour in the heat of the afternoon upon our arrival while we waited for our hotel rooms to be cleaned! The last evening, we shared traditional Spanish tapas by the Guadalquivir River and ended our night with a long walk in the city. 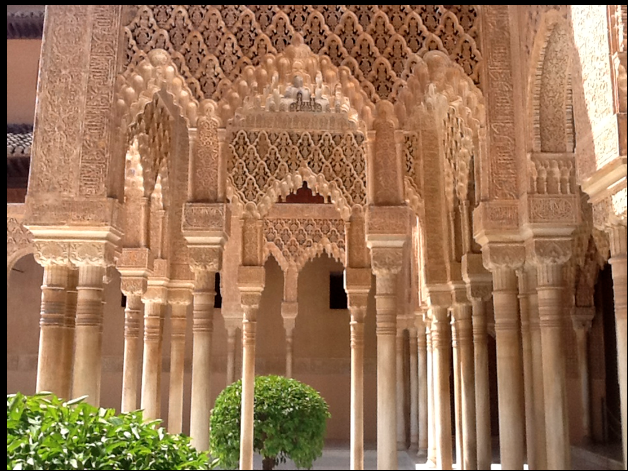 We took a low-speed train further east to Grenada, the sight of the famous Alhambra (the final stronghold of the Moors in Spain, defeated in 1492). 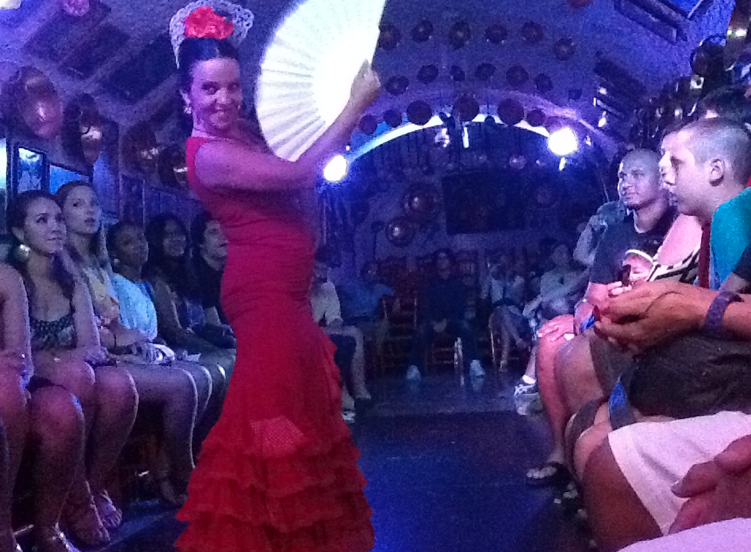 We also attended a traditional, authentic flamenco show our first night in Grenada! 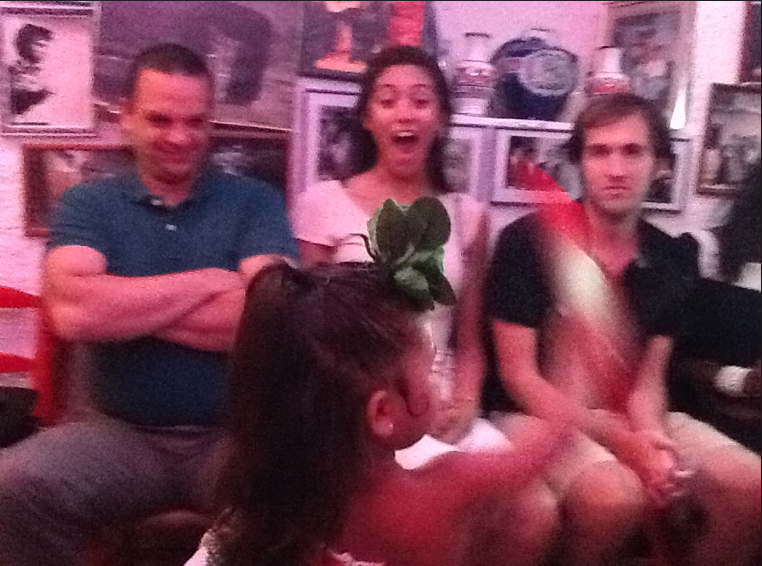 What made the show so fantastic was not, however, the gorgeous costumes or the magnificent dancing before our very eyes–but the appearance of a two-year old dancer in a polka dot dress and a miniature fan who joined the adults! 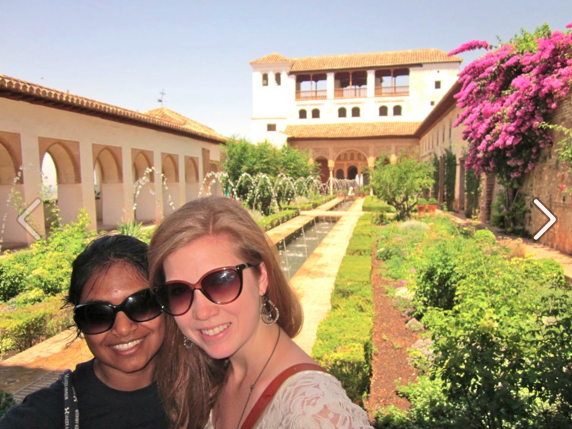 Andalucía was the Spain I remember from when I was fifteen and embarking on my first solo international trip. 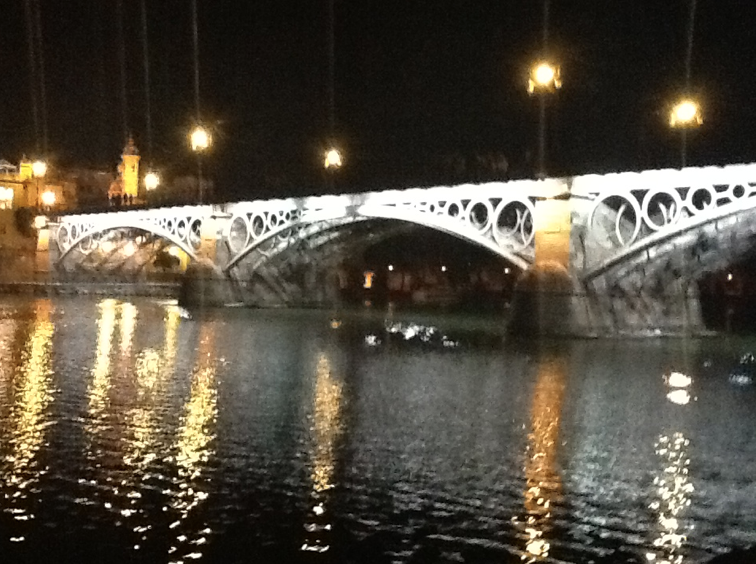 I discovered an entirely new facet to Spain in the capital, Madrid, where our program takes place! Ascending the stairs from the metro exit from the airport into the heart of Madrid where the residencia is located, I couldn’t believe how European everything looked in comparison to Peru! Buildings had sweeping bay windows and balconies out of a fairy tale; Spanish women walked down the streets in mile-high heels and breezy fabrics as if off a runway. Despite the intensity of the workload here that demands not only my evenings during the week–but also (gasp!) valuable siesta time that is so valued by the Spanish–I have managed to see and learn so much about Spanish culture and history. With the mandatory conversations with madrileños (citizens of Madrid) an important segment of our classes, I have discussed the Franco-era, gender issues, and even the tradition of soccer during the Eurocup! I have participated in a flamenco class (much to the horror of my classmates), discovered the Spanish concept of the siesta and ocio–taking the time to relax and enjoy life (something we Americans sometimes forget), and integrated a crimson fan into my daily wardrobe (a gift from a Spanish wedding during my visit with my aunt and uncle). 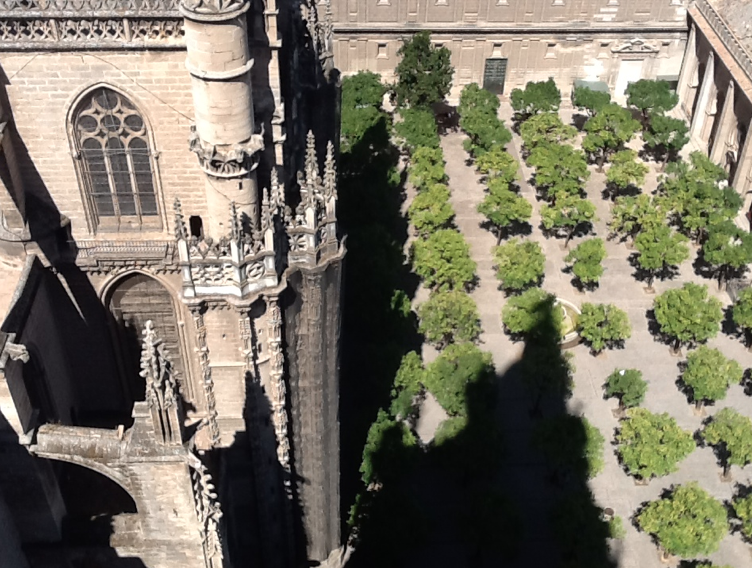 My first weekend on the Madrid portion of the Spanish LBAT was free for students to travel. Most of our classmates elected to travel to Pamplona, Spain, to run with the bulls–a major Spanish cultural event. Combined with a desire to survive to complete my Spanish minor and as a wish to see more of Europe, my roommate Catherine and I elected to instead fly to Budapest, Hungary. After a long day of classes, a late flight made even later with a two-hour delay, and the devastating discovery that our hotel room did not have air conditioning, Catherine and I finally collapsed into bed with our alarm set for bright and early the next day. 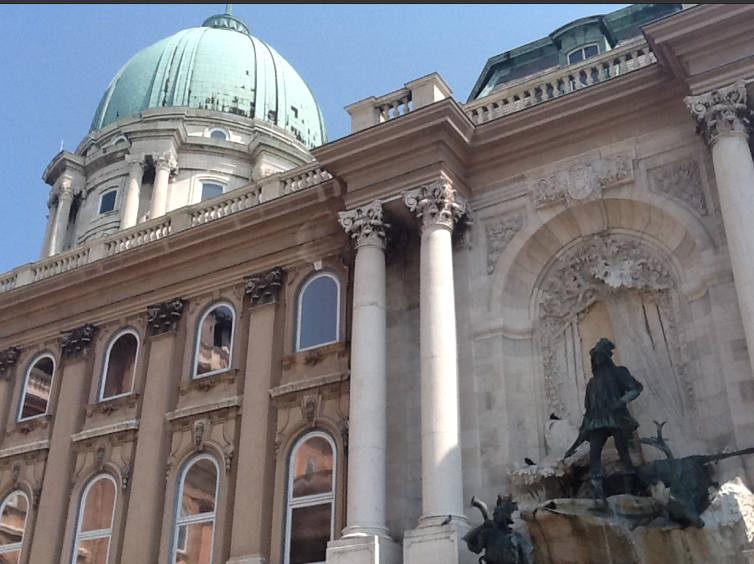 Our hotel was only a short walk from the bridge that led over the Danube River to the center of the city. Following a walking guide and our research from the night before, we had breakfast at perhaps the most famous café in the city—Café Gerbeaud. 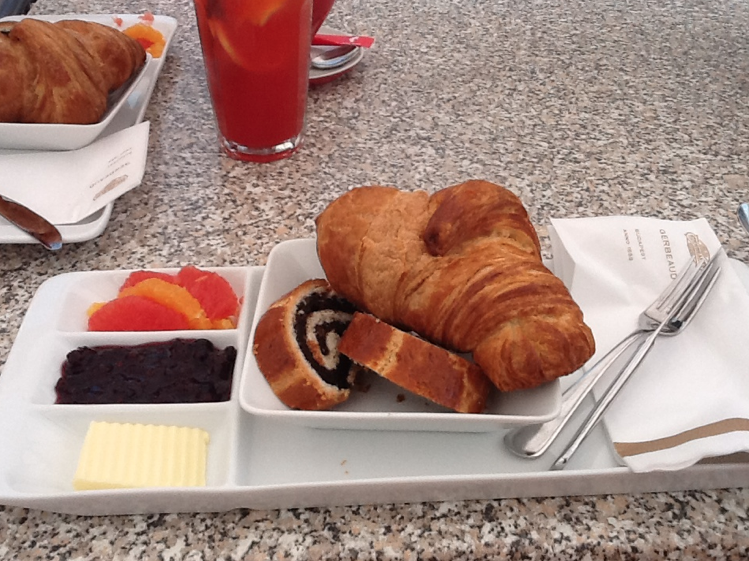 I ate what was perhaps the most fantastic breakfast of my life, composed of sparkling elderberry lemonade, a café latté, croissants with fresh raspberry jam, date and raisin rolls, and fresh fruit. Afterwards, Catherine and I crossed the bridge back to Buda (the city is divided into two parts by the Danube—Buda and Pest). 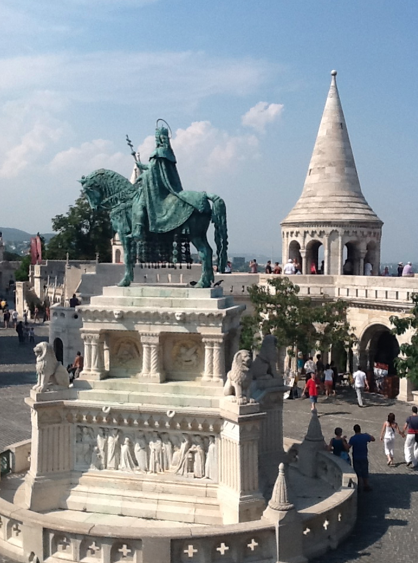 We climbed the stairs up to a fort erected in honor of Soviet soldiers on Gillért Hill, and afterwards visited Buda Castle. We spent the afternoon at Fisherman’s Bastion, a lovely stretch of turrets that provide a magnificent view of the city across the river. To cool off, we then toured the famous labyrinth underneath the city used as an air-raid shelter in World War II and known as the dungeon where Dracula was imprisoned. We had dinner at a beautiful restaurant in the center of the city–a shared salmon appetizer with rosé Hungarian wine, an entrée of veal neck and carrot purée on a bed of cabbage with Hungarian white wine, and a shared dessert of raspberry cottage cheese mousse–a meal not only typically Hungarian, but also extremely delicious! We ended our evening with drinks under the lights of St. Stephen’s Basilica. The next morning we had grand plans to cross the bridge and visit the Parliament Building; however, we were not permitted to cross because of the filming of Die Hard 5! Though we didn’t fulfill the walking guide’s itinerary for our last day in Budapest, ruining a take of Die Hard, being hustled off a major European bridge by Hungarian police, and witnessing a live mob scene (complete with three-piece cream suits, a roaring helicopter, and a damsel in a scarlet dress) made for an exciting final day anyway. The week after we returned from Machu Picchu, we bid goodbye to our old professor and began our new class on the cultural patrimony of the city of Cusco with a new professor. Our last week in the city was characterized by varied interviews, city excursions, and a flurry of packing to begin traveling around Peru. Our last weekend we spent in the city of Puno on Lake Titicaca, the highest navigable lake in the world, taking an overnight bus to get there. After a Peruvian-style breakfast much too early in the morning at the hotel we would return to Sunday night, we ventured out on motorcycle taxis to the coast and boarded two boats for the lake. We visited an indigenous community only ten minutes from the mainland, that lives on small islands they hand make with dried reeds heavily stacked and bound together; these islands float for almost twenty years before they sink and the community must relocate. We began our three hour sail to the indigenous island of Amantani where we would pass the night with indigenous families. After a much-needed nap on board the boat, we landed on the island and were divided up among the women of the community. I was to share the home with not only my roommate, but also my new professor and the school coordinator. We had a simple, but delicious lunch of muña tea (for digestion) and potatoes and rice; afterwards, we headed to the football (soccer) arena to play a match and then head up the mountain to watch the sunset. Combined with our later view of the Vía Láctea (Milky Way) that shot clearly across the sky later that night, Amantani was easily the most celestially beautiful place that I have ever been! We visited the island of Taquile the next morning; even though we had to hike nearly an hour uphill to reach the main plaza of the community, the fresh trout and quinoa lunch and spectacular views were well worth the effort. We slowly made in down the stairs to board the boats and return to the Puno hotel later in the afternoon. A hot shower was much appreciated after no running water on either island! Monday was spent returning to Cusco from Puno, a long, arduous bus ride–made all the worse because class was held for three hours; that night, we bid farewell to Cusco by dining with our respective families and going out in a small group for dessert off the main plaza. Tuesday we worked on our final projects; then we said goodbye to our host mother and left Cusco later that evening on an overnight bus to Arequipa. Arequipa was simply lovely when we visited–I wish we had been able to spend more than a day there! The architecture is quite European in style, much more Spanish than the indigenous-influenced Cusco. The Plaza de Armas of Arequipa is characterized by a magnificent gray fountain surrounded by pigeons that will happily eat from your hand, as well as a grand Cathedral. The Cathedral is simply spectacular inside–a giant organ from Belgium, peach-washed walls with cream crown-molding, and a collection of artifacts from various points in the Cathedral’s history . We were able to see ruby and emerald-encrusted crowns of Spanish saints, gold and silver-threaded vestments of the church officials, and diamond-studded chalices used for Holy Communion. We finished our tour on the roof; the tour guide pointed to a massive volcano clearly visible from our position and allowed us to tap the massive bell that proudly overlooked a splendid view of the Plaza. We finished up a lovely afternoon by dining Peruvian-style on a balcony over the Plaza and ordering gelato on the way back to the hotel. We had some early-evening work and yet another overnight bus ride. We arrived in Lima on Thursday morning. Settling into our hotel rooms in the trendy, beautiful district of Miraflores, we were able to grab a small lunch in a café before we were to meet in the lobby for an afternoon tour of the city. The Lima historic district is breathtaking–not only does the Lima Plaza de Armas have its own massive Cathedral that we were fortunate to tour, but it also is surrounded by cheery yellow-painted government buildings in the Spanish-style architecture. The Plaza is also home to the magnificent president’s mansion, which has a changing of the guards not unlike Buckingham Palace in England. Lima has a vibrant night-life which a group of us enjoyed later in the evening. We had a lovely tapas dinner at Café Café, and then ventured into the discotecas that the Spanish world loves so much. These clubs feature salsa dancing and often live music! We visited ruins on the outskirts of Lima early Friday morning, had another tour of Lima, and concluded in the early afternoon for some free time to shop, eat, and pack (most of us had to leave for the airport at 8 PM that night). I had an Italian-Peruvian fusion lunch in a Miraflores park of gnocchi de ajé de gallina (gnocchi with a traditional Peruvian squash sauce); and we went to a highly-recommended restaurant on the beach for dinner where we dined on lomo silvestre. 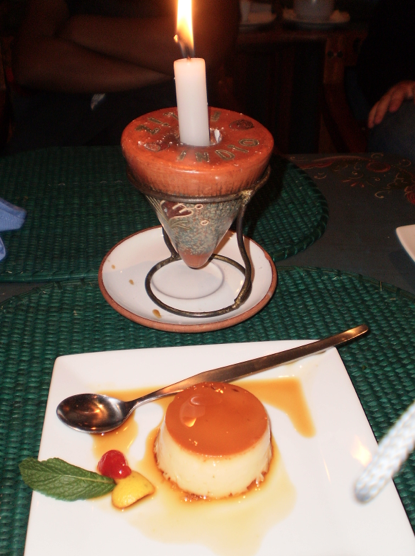 The only thing missing from our final meal in Peru was time for dessert! I had to leave at 4 AM Saturday morning for my flight. While most everyone completing the Spain portion of the program and Peru program returned to the States for the week we have off, I flew directly to Europe. I am currently visiting my aunt and uncle, who live in the southernmost region of Andalusia, Spain. I hope to spend my free weekend of the Spanish program in Casablanca, Morocco–with such fantastic adventures in South America, I can’t wait for Europe and Africa! 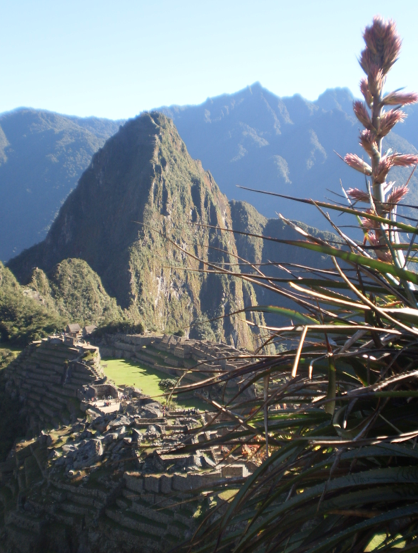 Over the weekend, we finally were scheduled to go to Machu Picchu–one of the seven new wonders of the world! We began our trip early on Saturday morning at 5 AM, taking a bus to Ollantutamba. 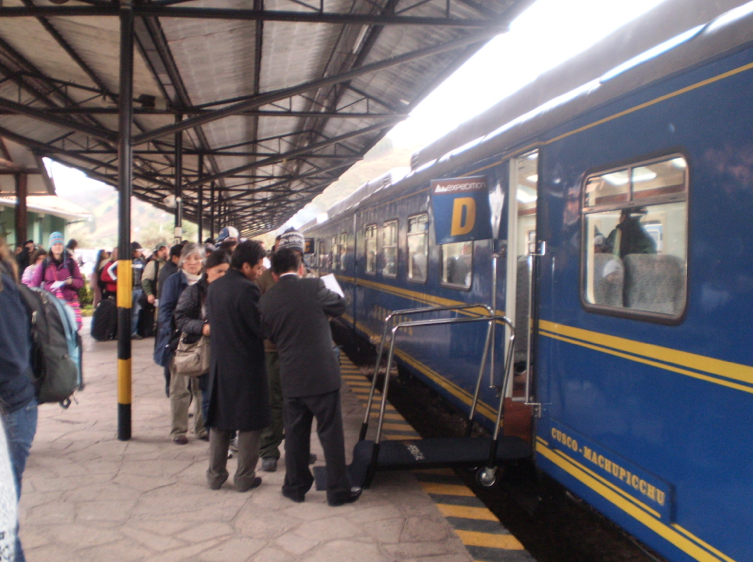 Here we boarded a train for a three-hour trip through the mountains to the small town of Agua Calientes, situated at the base of the mountain that holds Machu Picchu. After a fantastic Peruvian buffet lunch at a chic little restaurant in Agua Calientes, we all boarded the bus that would take us up the winding dirt road to the top of the mountain and Machu Picchu! After hundreds of photos and a guided tour of the site, we descended back down to the mountain to visit the hot springs and eat dinner, another amazing three-course meal that was a fusion of Peruvian-French cuisine. I returned to the hotel to enjoy a long, hot shower and the fluffiest pillow I have seen in over a month abroad. The next day, we woke up at 6 AM to have a leisurely breakfast at the hotel before we departed at 7 AM to return to Machu Picchu. With three hours on our own, we took what seemed to be thousands of photos and toured the entire ruins, paying special attention to the llamas that freely graze in the middle of the site. At 10 AM, our entire group lined up to sign the registry to embark on our ascent of Mount Huaynapichu, an hour-long hike up thousands and thousands of the steepest stairs I have ever seen in my life. The hike was well worth the view that greeted us when we finally made it to the top of the mountain! Our group returned to Agua Calientes for a leisurely buffet lunch and an early afternoon of relaxing in a restaurant, sipping drinks and scrolling through our photos, before we headed back to the hotel to pick up our bags and head to the train station to return to Cusco. It was a spectacular weekend! What a wonderful experience I am having in Cusco, Peru!!! My surroundings are gorgeous, the school (Centro Tinku) is beautiful, and my host family is marvelous–what more could I ask of a study abroad experience?! So far, my favorite adventure has been our group’s excursion to Pisaq, a site of the Incan empire. 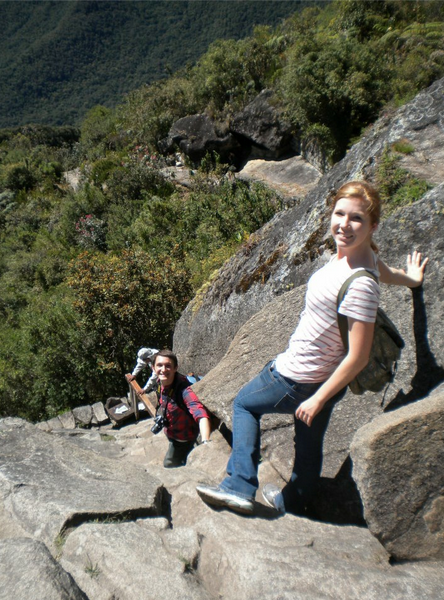 After climbing what seemed to be endless stairs, navigating through a cave, and hiking up more hills (all the while huffing and puffing from the altitude–Cusco is two miles above sea level! 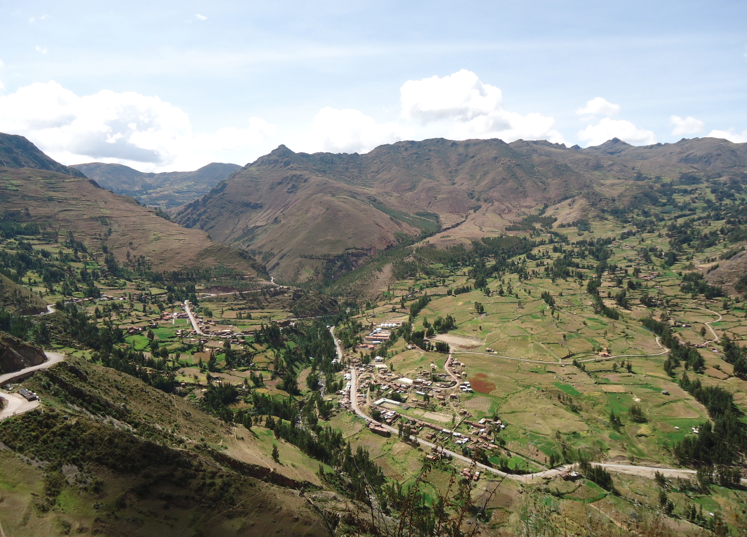 ), we finally reached the ruins of Pisaq and the fantastic view that awaited us! I’ve loved all of new food I’ve been exposed to so far in Cusco! My host mother makes my roommate and I fresh juice every morning before school, varying from papaya or mango or pineapple! I’m in love with all of the different varieties of potatoes that they offer here in Peru! 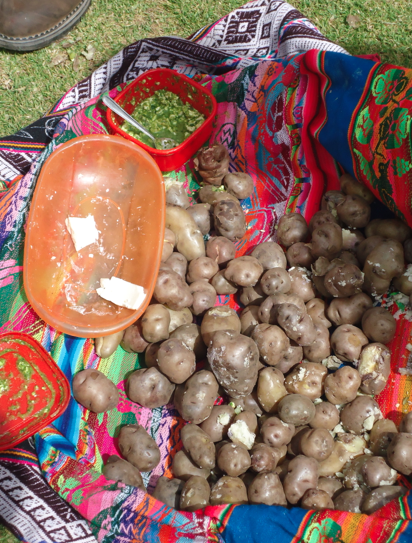 When we visited el Parque de las Papas (Potato Park, a park dedicated to maintaining the Peruvian biological potato diversity) and after we toured the greenhouses, we relaxed with a typical Peruvian snack–potatoes, what else? I have yet to try the national dish, el cuy (guinea pig)–but I will! Supposedly it is very popular during Corpus Cristi, a religious festival that will occur while we are in Cusco. But they are so cute! 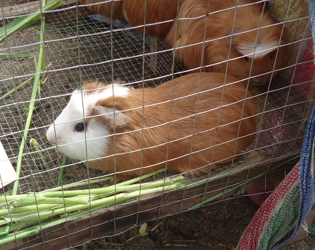 When we visited a livestock fair, we all held the guinea pigs and it was difficult to imagine eating them. I am enjoying the peace and serenity here in Peru. Although we are all working hard to earn our nine credit hours in six weeks, we still get to enjoy the views and nature that the Incas so prized during our weekend excursions when we venture outside the city of Cusco. Initially I did not understand the concept of las huacas that Doctor Galloway described to us in class–las huacas are anything sacred to the Incas for uniqueness or beauty or any other outstanding quality. Anything could be a huaca (a view of a mountain, a mask–a stone even). Sitting down and taking the time to observe the beauty of Peru, huacas are making more and more sense to me. I am so excited for the next month that I have left in Cusco! A group of us went to the regional hospital before school this morning to receive our yellow fever vaccinations because we are going next weekend to the Amazon rainforest! The following weekend–Machu Picchu, here we come!! !